Two human figures had been walking for hours through the arid landscape of a Mexican desert. The old teacher, Don Juan, would stop at times to burst out laughing at the especially confused attitude of the apprentice. Carlos Castaneda struggled against the feeling of personal humiliation. He didn’t know how to behave before that surprising master who considered one’s death one’s good counsellor, who talked to the wind and taught that life must be lived minute by minute, lest one sees 90 or 100 years uselessly slip by in an instant. What was the real purpose of Don Juan? He took the lower self of his disciple Castaneda to a “crisis” in order to stimulate the awakening of “a second attention”, a wider point of view, through which the higher self could start reorganizing and guiding the everyday consciousness of the apprentice. Every authentic religion teaches that the human being is dual: part of him is animal and dies: another part is divine and immortal. According to esoteric philosophy, the path to wisdom consists precisely in elevating the focus of consciousness from the lower levels of vibration to the higher ones. This must take place gradually. One lifetime is not enough. The spiritual soul will reincarnate as many times as necessary to reach the goal. As it gains experience, little by little it learns how to better influence its external and physical personality. At first, it seems impossible. Much later, the spiritual self will acquire complete knowledge and power over its lower nature, and attain to an essential freedom from human realm. Christ, Buddha and other beings who attained human perfection are in fact pioneers and forerunners of the future. They show the way to the other human souls. By stopping to worry about himself, every human being can hear the voice of his conscience and see that his inner “guardian angel” is one more name for his “higher self”, also known as Monad and Atma-Buddhi. The deeper meaning of the phrase “to follow the way of Christ” implies following the way of self-improvement. It is not enough to worship a humanized image of God. The task consists of undergoing a personal revolution during which we learn to look at life and to act from the point of view of the immortal soul, and not from the point of view of the physical life, with its laziness, attachment to comfort, fears and ambition. Between the immortal soul and the external personality, the average focus of human consciousness - which we call “I” - gradually elevates itself as the soul obtains wisdom and accumulates experience. The mere knowledge of these facts is not enough: victory or defeat will depend on what we do, once we know about the facts. Elevating the focus of consciousness is an objective task which poses practical questions. 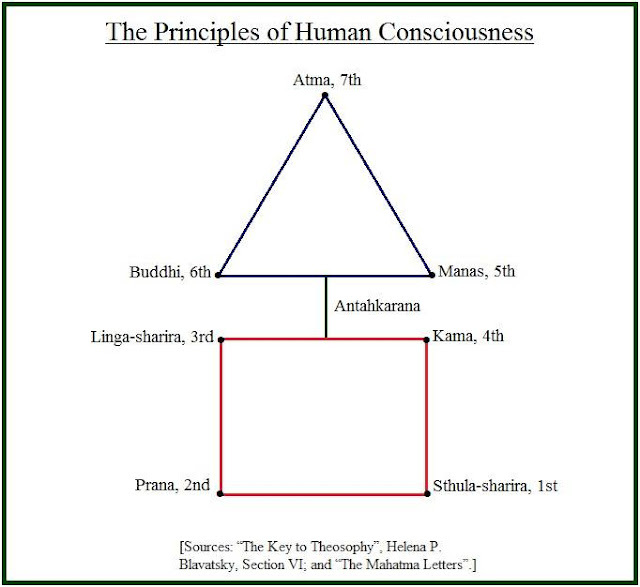 The complete map of human consciousness includes seven great principles or levels. On each of them, the “self” that organizes consciousness has different characteristics. In the following description, I keep the Sanskrit names because they have their own vibrations and are mantras. It is useful to include these words in one’s daily vocabulary. The physical body or first principle is made of flesh and bones. Its name is Sthula-sharira. The second principle, Prana, is the vitality. Acupuncture, Homeopathy and other forms of subtle Medicine work with the second and third principles, id est, Vitality, Prana, and the energetic patterns, Linga-sharira. The fourth principle, Kama, is the center of animal emotions. It includes and expresses fear, ambition, love with attachment, passion, rejection, and search for a sense of safety. These four basic principles form the earthly, mortal or lower Self. At the moment of death, the first three of them completely dissolve, and the fourth principle goes into the first afterlife stage, Kama-loka. The fifth principle is Manas, the mind. It is essentially dual. When it focuses on the lower world, it puts itself at the service of animal feelings and animal vitality (even if sometimes using a fine “spiritual” vocabulary as whited sepulchres do). When it focuses on the higher realm, it is enlightened by the spiritual soul and searches the truth above all, acts with altruism and reflects the light of eternal wisdom. The lower part of the fifth principle - which we may call Kama-manas - has a sort of reasoning that follows personal desires, personal opinions, fears and hopes. The higher part of the fifth principle, Buddhi-manas, is the abstract mind, the spiritual intelligence which looks at truth without distortion or egocentrism. The sixth principle, Buddhi, constitutes the center of the immortal soul, the source of spiritual intuition and universal compassion. For the mind enlightened by Buddhi, the world has ceased to be an accumulation of external facts, sensations, emotions and thoughts. The higher intuition is in unity with the primordial reality present in all things. The Buddhic principle of universal compassion gives our personal existences their deepest sense and meaning. The seventh principle is Atma, the whole, the all, the supreme reality present in us. Its substance is the same energy that maintains the galaxies alive; it is also the ultimate source of one’s will to act correctly in every situation. Atma is no “human” principle. It is the spark of the Absolute and the Infinite. It connects us with the essence of the whole cosmos. The seven principles can be divided in two groups. We have above the immortal triad: Atma, Buddhi and Manas. Below, we find the lower quaternary formed by Sthula-sharira, Prana, Linga-sharira and Kama. The dynamic bridge between these two sectors of our occult structure is called in Sanskrit Antahkarana. See the image above. How can one fulfill, then, the great task of elevating the focus of consciousness and transferring it to the higher triad? The central key to the process is in Antahkarana. According to our degree of evolution and attitude towards life, the “bridge” will be wider or narrow, and it can be unobstructed or not, in the different situations of daily existence. What makes us humans is precisely the electrical and creative tension between the animal or negative polarity, and the divine or positive polarity of life. The wider the Antahkarana, the more intense the contact between earth and sky within us. The feeling of devotion for beings that are more advanced than us is one of the factors in the dialogue between earthly self and spiritual soul. The teachers of universal wisdom are practical examples of the ideal of human progression and perfection which the truth-seeker adopts. As we saw above in the dialogue between Don Juan and Castaneda, the practice of altruism makes it possible to eliminate the feeling of self-importance that prevents one from grasping the spiritual truth. 1) Right view of life - To look at the world as a vast field of research and learning. 2) Right thought - To observe reality impersonally, so as to avoid the distortions produced by fear and illusion; to focus thought in elevated topics and not to allow it to disperse. 3) Right word - To speak and write with sincerity, using no tricks, falsehood or aggression. 4) Right action - To abstain from causing injustice. Trying to remove the causes of suffering. 5) Right livelihood - To have a useful profession and to work with good will and balance. 6) Right effort - To live each moment with attention, avoiding laziness or anxiety. 7) Right memory - To learn from the past so as to correct mistakes. To keep in one’s mind the spiritual teachings and the precepts of eternal wisdom. 8) Right concentration - To have noble and clear goals, organizing one’s practical life in the short and long term in accordance with them. Actions, emotions and thoughts must flow and find their places in increasing harmony with the constant inspiration from the immortal triad, which enlightens the lower quaternary. At first glance, Antahkarana connects the abstract mind (Buddhi-manas) to the concrete mind (Kama-manas). However, as we look at it from a deeper point of view, we see that Antahkarana includes multiple connections between the immortal triad and the basic quaternary. Each of the principles interacts with all the others. All of them permanently exert a mutual influence through the dynamics of their vibrations. Atma, for instance, has a specific relation with each of the other principles. The same occurs with Buddhi and Manas. On the other polarity, a physical self-discipline will increase the vitality (Prana); improve the subtle “double” (Linga-sharira); make the emotions (Kama) become purer; and clarify the ideas (Manas), making it possible to better express the spiritual will of Atma and the intuitive compassion of Buddhi. And so on: each principle has one dimension on which it exists in itself, and six other dimensions where it interacts with the other principles. The spiritual path provokes inner conflicts in the mind of the truth-seeker that may be more severe than the conflicts in the minds of common citizens. It is in the soul of the apprentice that the great war between light and shadow takes place. The battle field is the lower self. On one side, we find the sectors of our mortal personality that are loyal to the higher triad. On the other side, we see those parts of our personality which gravitate around our animal soul, and which are mainly interested in laziness, pleasure and personal power. These often disguise themselves as spiritual feelings, and use noble motives as a camouflage. Thus they cause unnecessary suffering and induce one’s soul to make mistakes. The war between light and shadow has many unpredictable episodes. The virtue of courage can become lack of prudence. The virtue of patience, on its turn, may pave the way to laziness. The result from this conflict is discernment, that is, the ability to distinguish the true and the false. Discernment - Viveka in Sanskrit - is one of the keys to the door of soul-heaven. Combined with it, each virtue finds its balance and the dangers of exaggeration and anxiety are overcome. As a way to simplify the practice of self-observation, I have created a monitoring system for the action of Antahkarana. It makes it easier to see whether the “bridge to sky” is fully active, or faces obstruction due to selfish feelings and thoughts. If there is a hindrance in the relation with his higher self, an individual feels personally comfortable as long as everything seems to be easy to him, and he feels ill at ease when facing difficulties is necessary. When Antahkarana is free from impediments, the individual has a sense of “inner togetherness” and feels he is OK all the time through the ups and downs of life. The individual is severe toward the others and “generous”, or indulgent with himself. He is severe with himself and generous towards the others. Or at least he is as rigorous with himself as he is with the others. He gets secretly sad or angry with the victory of his colleagues, and feels intimately happy to see their defeat or failure. This symptom is especially dangerous if the object of envy is another pilgrim in search for spiritual truth. The student becomes innerly happy with the victory of his colleagues, and sincerely works for it to happen. It is unpleasant to him to see the defeat of others; but he does not desperate, and helps them to persevere. He tries to obtain divine blessings and protection for himself exclusively. He works to help others along the way, and takes an active part in human evolution. He believes he has learned “many things already” and thinks that his actions have an extraordinary importance. Indulging in pride, he is sorry that his “unique talents” are not duly honored and esteemed by others. The individual feels that he is personally meaningless, because he keeps before himself the ideal of human progression and perfection taught by the great sages. When he obtains a victory, his joy is anonymous. He does not believe in personal defeats or personal victories. He talks about his own wisdom or suggests that he may have great knowledge. He has the attitude of an important person and tends to subtly underestimate the others. With a free connection between personality and spiritual soul, one obeys to an inner prohibition from making propaganda of himself. He knows that nobody is the private owner of anything that has an eternal value. He understands that the wisdom does not belong to him, or to anyone else. The individual acts according to appearances and adapts his behavior to external stimuli and conditions. This is because he didn’t learn to listen to the voice of his own conscience. He acts in accordance with an inner inspiration and does not exaggerate the importance of appearances. He has the courage to challenge collective automatisms and the social behavior based on fear and attachment to routine. The student struggles for personal power in those situations and areas of action that are already established. He uses mainly the left side of the brain, which focuses on a limited view of the past and works with repetition. He creates new opportunities and ways of working and transforms old situations. While cherishing the past, he knows how to use the right side of the brain, from which creativity and spiritual consciousness flow. With a hindered Antahkarana, the fear of death is so great that the very topic is often denied and transferred to the subconscious. By closing his eyes to reality, the individual wastes time and energy. The student can see that each moment in life is valuable. He knows that an entire lifetime can pass by rather quickly. He fears living in incorrect ways and regularly evaluates his life, adjusting his priorities. There is an excess of confidence in the intellect and a search for security through attachment to his own opinions. When the lower levels of mind are unable to feel comfortable with silence, one gets attached to words and tries to convince oneself that one is the personal owner of truth. With an unimpeded Antahkarana, the student values the ideas of others and benefits from examining them, while preserving the clear notion of his own values and goals. Feeling uneasy when alone or in silence is a symptom of obstruction. An anxious “need to be with others” stimulates the superficial layers of mind. The tendency to pay too much attention to personalities is also part of the problem. One feels OK when alone and knows that spiritual life invites to silence. The deeper layers of the mind need a simple and peaceful life. This will seem monotonous only to those who think that “living in noise” is the same as “having an intense life”. He who eats for gluttony, momentarily forgets his higher self, or is excessively absent from his body. Eating with moderation and keeping a balanced diet helps one to widen the doors to higher inspiration. The above “Antahkarana Meter” may be expanded by each specific student. Every phase of human life produces different opportunities to be loyal to one’s spiritual soul: identifying them and taking advantage of them leads one to inner peace. There is a curious, little known technical aspect regarding Antahkarana which deserves examination. One normally thinks of the higher planes of consciousness as if they were “inside” human being. Atma and Buddhi, according to the notion, would be located in the head and heart. This is only partially true. The subtle principles are all larger in their magnetic fields than the physical body, and the more subtle and elevated they are, the larger they get. Antahkarana constitutes a connection of our denser principles with the more external and nobler parts of our aura. In fact, Atma and Buddhi float over our heads as invisible aureolas. The aureolas painted in portraits of great saints and mystics of the past symbolize the awakening in them of Atma-Buddhi, the Monad, the spiritual soul. “One of your letters begins with a quotation from one of my own . . . ‘Remember that there is within man no abiding principle’ - which sentence I find followed by a remark of yours ‘How about the sixth and seventh principles?’ To this I answer, neither Atma nor Buddhi ever were within man, - a little metaphysical axiom that you can study with advantage in Plutarch and Anaxagoras. 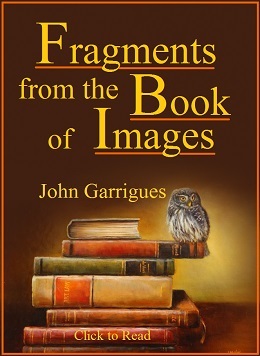 (…) The former taught on the authority of Plato and Pythagoras that the semomnius or this nous [spirit] always remained without the body; that it floated and overshadowed so to say the extreme part of the man’s head, it is only the vulgar who think it is within them . . .”. The Mahatmas teach therefore that there is no eternal principle inside human being. What there is inside is the ability to perceive, listen to and follow the spiritual light of Atma and Buddhi, which shines above the head. Contact between spirit and matter is often uneasy. In the average individual, there is a strong “cocoon of worries about oneself”. 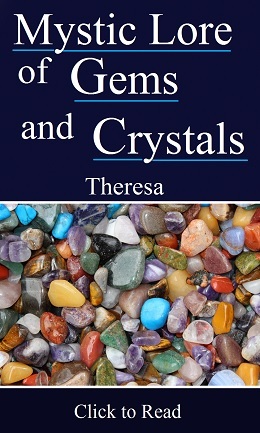 It is made of the emotional and mental matter surrounding physical body in the lower layers of the aura. It is this cocoon of self-importance that creates obstacles to the basic functions of Antahkarana. In spite of difficulties, our destiny is Light. Each human individual is a summary of the universe and of mankind. Just as there is a Jacob’s ladder or hierarchy of spiritual beings connecting sky and the earth (Genesis, 28: 12), there is also in each human individual a hierarchy of principles or levels of consciousness forming a ladder to celestial wisdom. Saying that the individual who lives in the 21st century must keep his head on sky and feet firm on the ground is the same as saying that we need to interconnect and harmonize our levels of consciousness, from the most divine (Atma) down to the most terrestrial and physical (Sthula-sharira). It is likely that we will not have total success in the attempts. However, from the moment we start trying, each small progress along the way brings us a growing degree of relief and satisfaction. “Journey to Ixtlan”, Carlos Castaneda, Washington Square Press, New York, copyright 1972, 268 pp., see pp. 21 through 26, especially 23. “The Key to Theosophy”, Helena P. Blavatsky, Section VI. See pp. 90-92 at the Theosophy Co. editions (India and Los Angeles). “The Mahatma Letters to A.P. Sinnett”, TUP, see Letter CXXVII, p. 455. The above article is a translation of chapter 12 of the book “Três Caminhos Para a Paz Interior” (“Three Paths to Inner Peace”), by Carlos Cardoso Aveline; Editora Teosófica, Brasília, Brazil, 2002, 194 pp. The text “Antahkarana, the Bridge to Sky” was published at our associated websites in September 2015. See the articles “The Seven Principles of Consciousness”, “The Seven Principles of the Movement” and “The Constitution of Human Nature”.